Thanks for getting it cleared up as I thought it strange that you got the same points (as someone who fished it, and put in the hard yards) even if you didnt turn up. That was the bit that was a bit confusing for me. 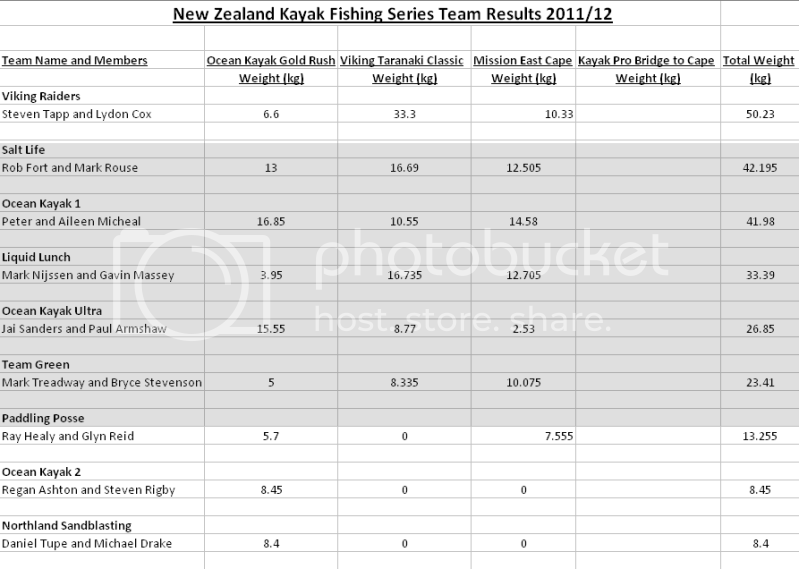 I entered the Naki event, weighed 5 spieces, won the runner-up for the John Dory, but I'm not on the points table. Is that because I missed the first event? Or did I miss something in the application? Im heading up to the BOP event and would like to do the Bridge to Cape (to far away to book it with the misses yet). hi tara yakka, did you enter the nationals?? At the Naki comp prizegiving Shamus mentioned about anyone wanting to enter the nationals to contact him. I was of the understanding that entries had been shut since about November. Is this correct or is there another chance to get involved? Does anyone know if you still enter the nationals? I'd be keen as a been. But will still be at the BOP comp for sure, and even the Bridge to Cape if I can get the time off. Here are the current points for the series after the East Cape Mission results have been added. Nice work Rayh, rocketing up there. 'cause I'm a geek I thought I'd see what the targets for the Kayak Pro Bridge to Cape would be, this is the target each person needs to take first place from Peter Michael - and it assumes he only gets 30 points or less. Mental wrote: 'cause I'm a geek I thought I'd see what the targets for the Kayak Pro Bridge to Cape would be, this is the target each person needs to take first place from Peter Michael - and it assumes he only gets 30 points or less. Yea don't read my post wrong I too agree it's a great series and Justin is doing a great job. I can not wait till the Coro event, when I will be joining the series. Had a brief chance to tell Justin what a great idea it is, and what a very well thought out group of events the series is. Have done the Naki classic 4 times now and Im stoked there are more events to keep the kayak buzz going throughout the year. Not to mention a fantastic way to meet up with other like minded indiviuals, sink some piss and talk some . See you all at the bridge to cape. Mental wrote: Yea don't read my post wrong I too agree it's a great series and Justin is doing a great job. Last edited by Kingfish killer on Fri May 04, 2012 8:15 pm, edited 1 time in total. Tara Yakka wrote: I can not wait till the Coro event, when I will be joining the series. Had a brief chance to tell Justin what a great idea it is, and what a very well thought out group of events the series is. Have done the Naki classic 4 times now and Im stoked there are more events to keep the kayak buzz going throughout the year. Not to mention a fantastic way to meet up with other like minded indiviuals, sink some piss and talk some . See you all at the bridge to cape. For sure dude , nice to meet you at the East Cape briefly , sorry i didnt get round to having a proper beer with you . Hi Armie its Orty here. I have looked into doing a fresh water comp, but the logistic for such a event are not viable for me or you guys. I will be doing one more event.Watch this space. Orty is currently busy on a contract, so has asked if I can post this. 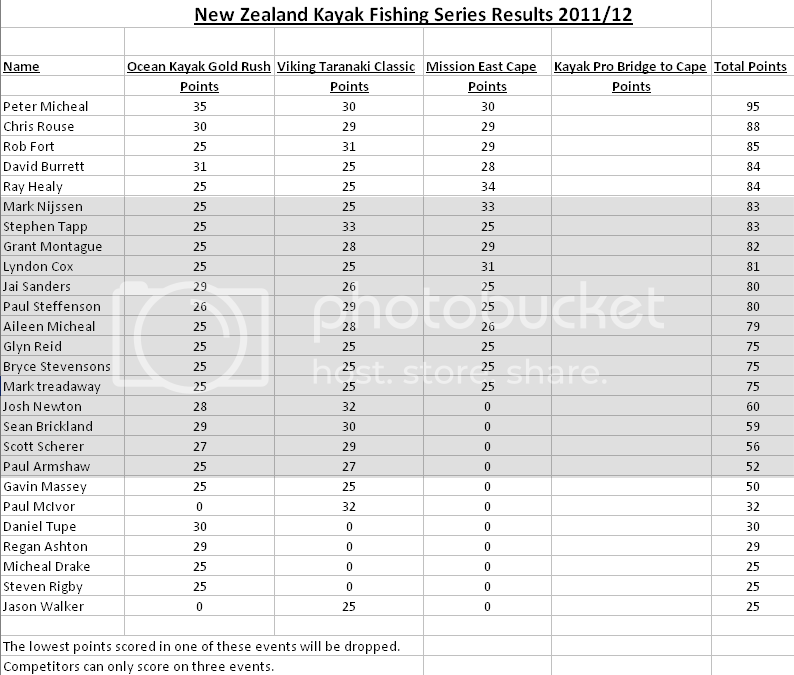 The new season of the Kayak Fishing Nationals will start after the last round (Bridge to Cape) is run up here in Northland on the 23rd and 24th June 2012. Entries are already closed for the current round. So for all of you who have missed out on the inaugural series, you will be able to start fresh for the new series then. You will have until the first round in Coromandel (7pm, 5th October) to register for the second series, which will give you just over 3 months to register. There will be no more entries taken after this time and date. Here are the final points for the 2011/2012 series.